Rural Pennsylvania's Vance Township Police Chief Pete Adams is down an officer and has been dealing with extra shifts as well as a pair of bickering neighbors, one of whom owns a machete and isn't afraid to use it. Golden Oaks Assisted Living is outside Pete's jurisdiction, but a murder in the facility his Alzheimer's-afflicted father calls home makes the case personal. Paramedic and Deputy Coroner Zoe Chambers has been itching for an opportunity to take the lead in a death investigation. She gets her chance when her boss is hospitalized and not only assigns her to the Golden Oaks homicide but puts her in charge of the county coroner's office. As if she doesn't have enough to handle, a long-lost, over-protective, older half-brother walks into her life threatening to drive a wedge between her and the man she loves. A second dead body leads them to realize the case may have dark ties to a distant past...and if Zoe doesn't untangle the web of lies, Pete will be the one to pay the ultimate price. 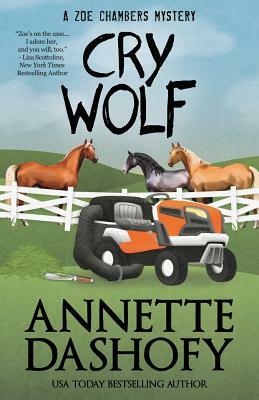 CRY WOLF by Annette Dashofy A Henery Press Mystery. If you like one, you'll probably like them all.